Part 3 of a series of 3 case studies on successful solar school campaigns. Be sure to check out part 1 and part 2 as well. The science department at a southeast Michigan high school is now fully powered by solar energy, thanks to the dedication of a teacher and his students. West Bloomfield High School first received a grant for a 3.4 kilowatt (kW) solar array in 2011. This small solar system generated enough energy to power the science classroom of Joshua Barclay, but his students in the E.A.R.T.H. (Environmentally Aware, Ready To Help) Club wanted to do more. They wanted to leave a lasting legacy by providing the school with free energy for the future. Over the next few years, Barclay’s students researched what it would take to power the school’s entire science department with clean energy. To estimate the total energy demand, his honors physics class conducted a full energy audit of the department in 2017. They measured the energy draw of every device across all science classrooms, interviewed teachers to find out when the devices were on, and then used the data to estimate the department’s total annual energy use. The students realized that energy efficiency is a critical step to enabling renewable power. They calculated that simply upgrading all of the department’s lighting to LEDs would reduce the energy use by half and make it feasible to power all the entire science department with the addition of a 20 kW solar system. Barclay and his students in the E.A.R.T.H. club embarked on the solar campaign that they dubbed 20kW by 2020. After two years of dedication and hard work, the students raised nearly $25,000 for the project. They conducted bagel and pizza sales, collected donations for an LED bulb fundraiser, hosted a crowdfunding campaign, and applied for several grants. The E.A.R.T.H. club also conducted a solar energy resource analysis to determine the best location on campus for the solar system and to calculate the cost savings and reductions in carbon emissions provided by the 20 kW solar system. They made several presentations to the school board to explain the benefits of the school going solar. Once the financing was in place, the school board gave them the approval to go ahead. The students successfully fundraised for the upfront investment of $21,000. With that down payment, the school could lease a 20 kW solar system for 5.5 years and purchase the electricity produced from that system at 10% lower cost than its current wholesale rate. After the lease period, the school would own the system outright and benefit from the free energy of the sun for the life of the solar panels. The school is expected to save $65,000 in electricity costs over 25 years. “My students wanted to do this for the school district—to give them free energy for the future,” said Barclay. "From conception to installation to operation, our solar energy system has been a fantastic tool to teach real-world science,” says Barclay. 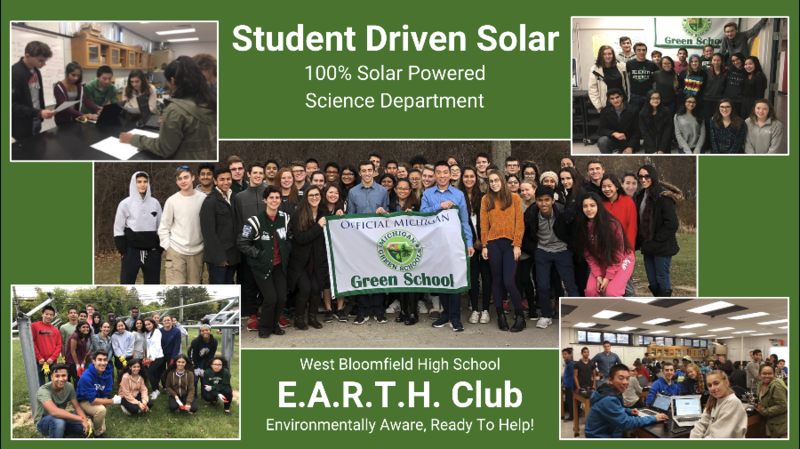 West Bloomfield High School students have been actively involved in every step of the process to power the science department with clean energy. Over the course of a few years, students calculated the science department’s energy needs, raised the money for the solar panels, secured school district approval, and even installed the ground-based solar photovoltaic system. Barclay will use the solar system as a tool for real-world learning and work with the E.A.R.T.H. club to learn how maintain the system for peak performance. When the school was given different advice from different solar installers on the best angle to set the solar arrays, this science teacher saw an opportunity for his students to research this real-world question.Beginning in 2019, Barclay’s students are going to experiment with different angles for the solar panel placement to assess which angle generates the most energy over various time scales. They will test different hypotheses to determine the optimal set up for the arrays, and they can share their results with local solar companies. The students involved in this solar project gained life skills that they will take with them into adulthood. The students applied economics when they had to create a financial goal for the 20 kW solar system, raise the money for their goal, and continue to research new ways to finance the solar system. By advocating for solar to the school board, they were practicing civics and learning the power of expressing their views to their local elected leaders. Throughout the process, the students were mastering their collaboration, communication and problem-solving skills. The new solar panels the students installed will also benefit the community by keeping 30 tons of carbon dioxide pollution out of the atmosphere each year. The solar panels will be a reminder to the school community of the role we can all play in creating a clean energy future together. 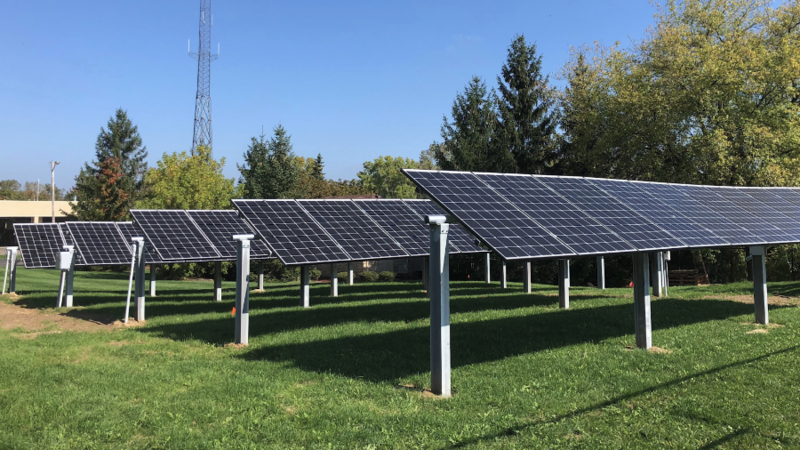 “Our solar system is not only accessible to our kids for learning, but it is also in a visible place on our school grounds where the public can see what we are doing and learn that solar is available for all,” said Barclay. Ready to learn more about how to run a successful solar schools campaign in your community? Check out our Solar Schools Campaign Toolkit.